The Nigerian Minister of Power, Works and Housing, Babatunde Raji Fashola has been accused of neglecting the deplorable condition of federal roads in Taraba state. Governor Darius Dickson Ishaku made the accusation yesterday while fielding questions from journalists at the presidential lodge, Jalingo. According to him, apart from refusing to give the dilapidated roads the desired attention, the federal government has also refused to refund the billions of naira that the state government used to construct some federal roads in the state when they became death traps. Ishaku explained further that a total of four bridges have so far been washed away on two federal highways in the state. Giving the breakdown of the bridges, the governor said, three of the washed away bridges are on Wukari Jalingo federal government trunk A road and also, there is one on Takum Wukari federal government trunk B road located in Chanchanji. “I wrote the minister, I asked him to give me the permission to fix the first three collapsing bridges and he didn’t reply. He rather brought a contractor whom I doubt his competency to handle the work”. 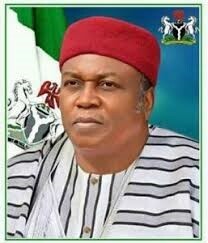 Ishaku lamented. The governor also said apart from refusing to allow his administration fix the roads for the people of Taraba and Nigerians, the minister went to the extent of ignoring his calls. “As I talk to you now, the road to Takum, from Wukari, the bridge at Chanchanji is washed away, I wrote him he did not reply even yesterday and day before yesterday, I called him, he didn’t pick.